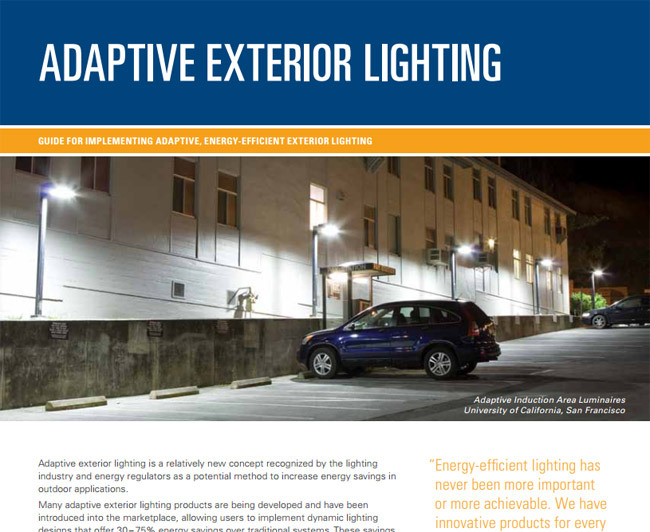 Adaptive exterior lighting is a relatively new concept recognized by the lighting industry and energy regulators as a potential method to increase energy savings in outdoor applications. Many adaptive exterior lighting products are being developed and have been introduced into the marketplace, allowing users to implement dynamic lighting designs that offer 30 – 75% energy savings over traditional systems. These savings are achieved by coupling advanced lighting controls with an efficacious, dimmable source. When a space is unoccupied or has substantially reduced traffic volume, adaptive luminaires deliver lower light levels with substantially reduced power consumption. The featured overviews include emerging design strategies, products, and systems. Widely adopted, these practices and technologies can reduce lighting power densities in commercial spaces while maintaining high-quality lighting, providing a tremendous energysaving potential for California. For example, new products available for task-ambient office lighting systems can save 40–60% in new construction or retrofit applications with power densities of just 0.6–0.7 W/ft2.2 Development of market transformation programs designed to overcome the market barriers to the task-ambient lighting designs could reduce peak demand by half, saving twice the energy and reducing CO2 emissions, compared to the current Title 24 code of 1.1 W/ft2 or typical lighting retrofits that only address the ambient lighting system. For traditional lamp types, source efficacy (expressed in lumens per watt, lm/W) is measured under steady-state conditions at a 25°C ambient temperature. 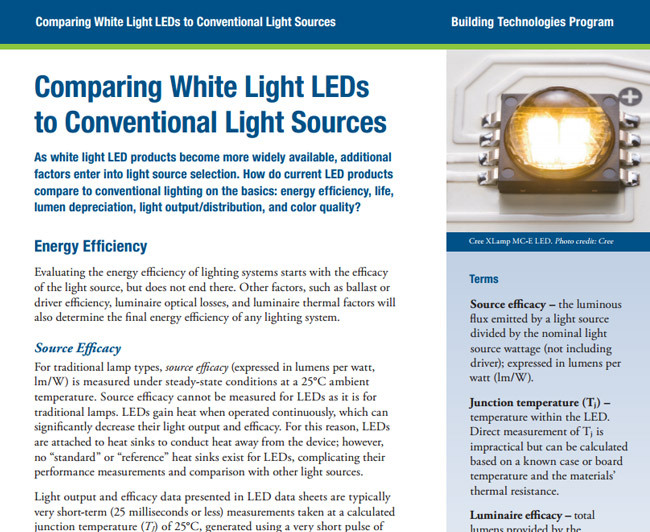 Source efficacy cannot be measured for LEDs as it is for traditional lamps. LEDs gain heat when operated continuously, which can significantly decrease their light output and efficacy. For this reason, LEDs are attached to heat sinks to conduct heat away from the device; however, no “standard” or “reference” heat sinks exist for LEDs, complicating their performance measurements and comparison with other light sources. Light output and efficacy data presented in LED data sheets are typically very short-term (25 milliseconds or less) measurements taken at a calculated junction temperature (TJ) of 25°C, generated using a very short pulse of current. Energy efficiency of light sources is typically measured in lumens per watt (lm/W), meaning the amount of light produced for each watt of electricity consumed. This is known as luminous efficacy. DOE’s long-term research and development goal calls for white-light LEDs producing 160 lm/W in cost-effective, market-ready systems by 2025. In the meantime, how does the luminous efficacy of today’s white LEDs compare to traditional light sources? 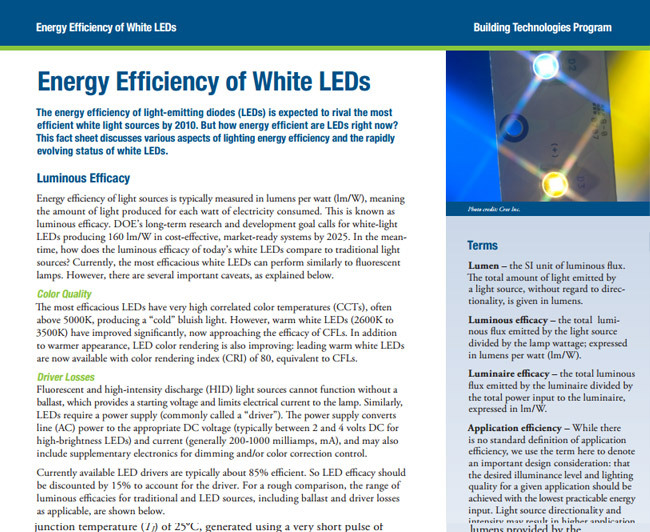 Currently, the most efficacious white LEDs can perform similarly to fluorescent lamps. However, there are several important caveats, as explained below. The most efficacious LEDs have very high correlated color temperatures (CCTs), often above 5000K, producing a “cold” bluish light. However, warm white LEDs (2600K to 3500K) have improved significantly, now approaching the efficacy of CFLs. Recessed “troffer” fixtures with fourfoot fluorescent T8 lamps are commonly specified in commercial and institutional lighting applications, and represent a significant installed base of fluorescent fixtures. Are LED replacement lamps a “drop-in” equivalent to T8 fluorescent lamp-ballast systems, as claimed by many manufacturers? 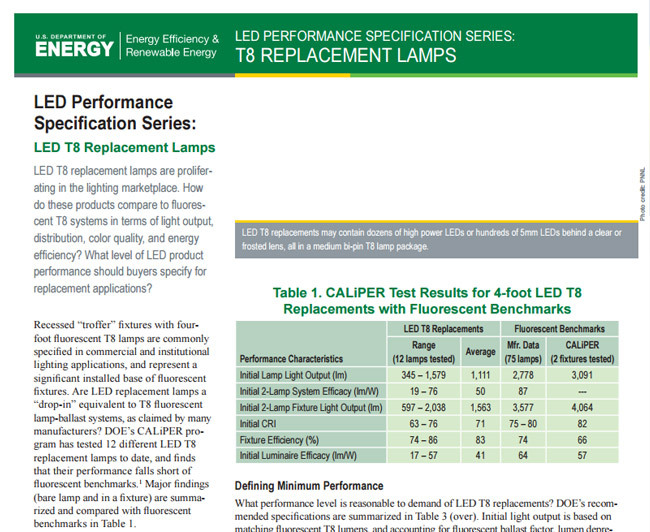 DOE’s CALiPER program has tested 12 different LED T8 replacement lamps to date, and finds that their performance falls short of fluorescent benchmarks.1 Major findings (bare lamp and in a fixture) are summarized and compared with fluorescent benchmarks in Table 1. Average initial bare lamp light output of the LED T8 replacements tested was about one-third the average for fluorescent T8s. On initial two-lamp system efficacy, two-lamp fixture output, luminaire efficacy. 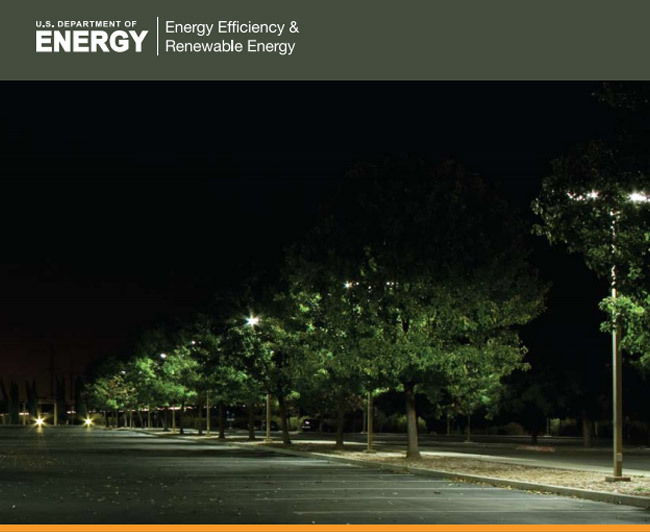 The U.S. Department of Energy, the Federal Energy Management Program, Lawrence Berkeley National Laboratory (LBNL), and the California Lighting Technology Center (CLTC) at the University of California, Davis helped fund and create the Exterior Lighting Guide for Federal Agencies. LBNL conducts extensive scientific research that impacts the national economy at $1.6 billion a year. The Lab has created 12,000 jobs nationally and saved billions of dollars with its energy-efficient technologies. 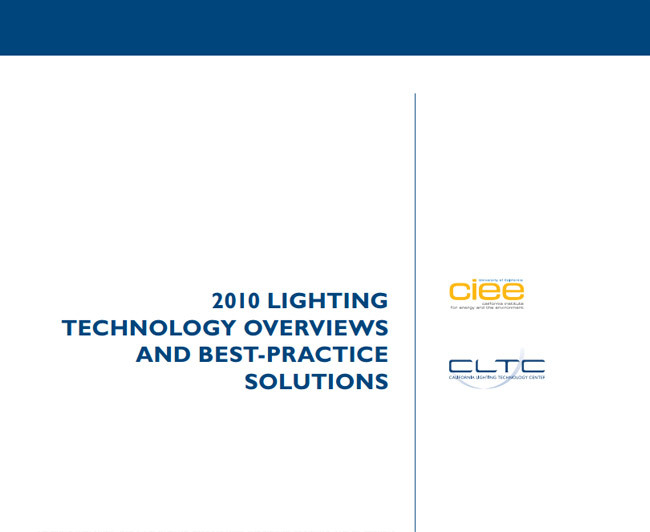 CLTC is a research, development, and demonstration facility whose mission is to stimulate, facilitate, and accelerate the development and commercialization of energy-efficient lighting and daylighting technologies.